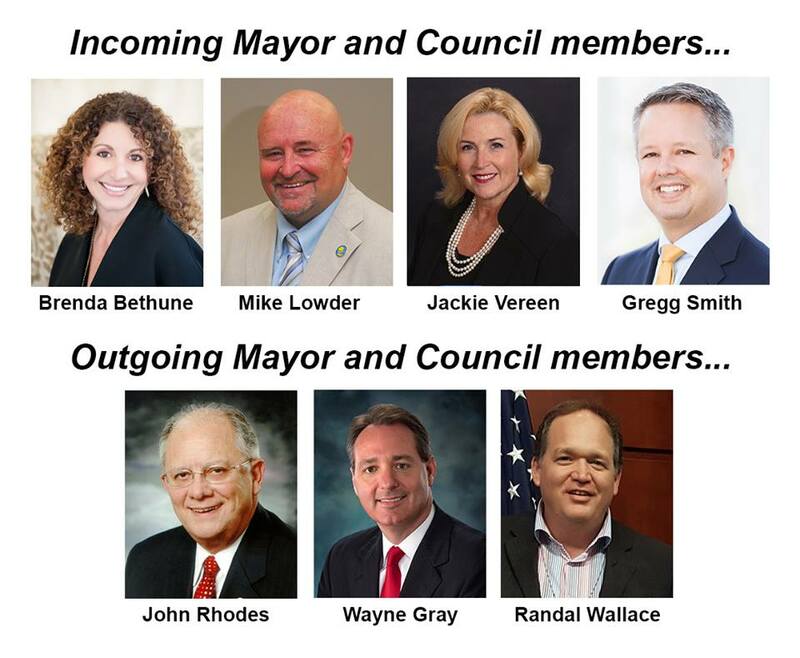 As we begin 2018, the City of Myrtle Beach is poised to welcome a new mayor, one returning Council member and two new Council members to four-year terms. This orderly transition of power – one of the hallmarks of our democracy – will occur at 1:00 p.m., Tuesday, January 9, in the Ted C. Collins Law Enforcement Center. The oath-of-office ceremonies are open to the public and will be followed by the first regular City Council meeting of the new year. John Rhodes served as mayor for 12 years and hands the gavel to mayor-elect Brenda Bethune. Councilman Mike Lowder was re-elected to his third four-year term, while newcomers Jackie Vereen and Gregg Smith both will begin their first terms on Myrtle Beach City Council. At the same time, we say goodbye to longtime Councilmembers Wayne Gray and Randal Wallace after 16 years each. Gray served from 1998 to 2002 and 2006 to 2018, while Wallace served from 2002-2018. Myrtle Beach elections are at-large and non-partisan. Under the at-large system, voters city-wide elect the Council members. Non-partisan means that the mayor and Council members do not run under any political party affiliation or banner. The mayor and Council members each serve four-year, staggered terms, which allows for gradual, rather than wholesale change. Last fall, voters elected a mayor and three Council members. In 2019, they will elect the remaining three Council members. For those who may not be familiar with the newcomers, here are brief biographies of each. Incoming Mayor Brenda Bethune is a native of Myrtle Beach and serves as the CEO and majority owner of Better Brands, Inc. She also owns BJ Investments, a property investment and rental company, and two bridal boutiques: The Little White Dress in Myrtle Beach and Maddison Row in Charleston, South Carolina. Bethune earned an Associate Degree in Business and has completed all required courses in the Anheuser-Busch Management Development Program. She received the Distinguished Citizens Award from the Pee Dee Council of Boy Scouts of America, the Special Operations Wounded Warriors’ Tip of the Sword Award and Horry-Georgetown Early Care and Teacher Education’s Champions for Children Award. Bethune previously served on the Board of Coastal Education Foundation, Coastal Carolina University’s Spadoni College of Education Board, Coastal Carolina University’s Visitors at Wall School of Business Board and the Coastal Carolina Bank Board. She was also a founding board member and previous board president of the Children’s Museum of South Carolina. She is a member of the SC Beer Association and the National Beer Wholesalers Association. Mayor-elect Bethune is a member of Seacoast Vineyard Church in Myrtle Beach. Incoming Council member Jackie Vereen is a graduate of the University of South Carolina with a B.S. in Business Administration. Vereen offers more than 25 years of experience in the tourism industry as a hotel owner. She previously served on the Community Appearance Board as well as the Grand Strand Water & Sewer Authority Committee. Vereen is a member of the Myrtle Beach Woman’s Club and attends First Presbyterian Church of Myrtle Beach. Incoming Council member Gregg Smith is a graduate of Myrtle Beach High School and earned a B.S. in Business Administration from the University of South Carolina. For the past nine years, Smith has been a Realtor with Century 21 Broadhurst. He previously served on the gsSCENE Steering Committee and participated in Leadership Grand Strand. Prior to serving on City Council, Smith served on the Board of Directors for both Habitat for Humanity of Horry County and the Grand Strand Miracle Leagues. Welcome, the new Myrtle Beach City Council!